Do you know what he’s doing good? Showing all his viewers how diverse art can be. Art is not only classical paintings or sculptures, art is an expression of the individual. Art is dance through ballet and interpretive dance equally, art is music through classical and jazz; in this case it is street art which is just as equal to works on canvas. Street art is a very valid form of artwork and I commend Rick for continuing on for many years doing his rant in Toronto’s famous Graffiti Alley. I understand that vandalism is not only frustrating for property owners but it’s also wrong. Nobody here is going to encourage defacing anything that isn’t approved or authorized to do so. However Toronto’s Graffiti alleyway is completely sanctioned and legal, so why not have Rick’s Rant encourage people to not only see what is being made there but also other artists to go there to apply their trade. My favorite is his rant, they are witty, sharp, to the point and aewosme. 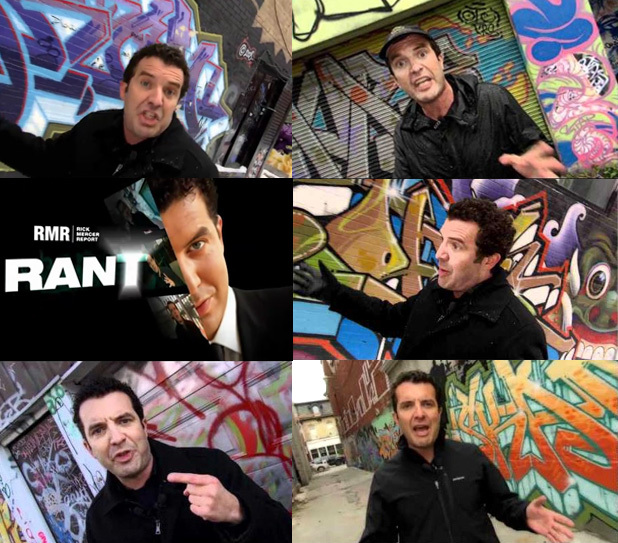 He has the perfect topic for them… Harper If you go to his website, Rick Mercer Report, you can see all his rants, some of them are aewosme… His show is back on early October yay!